In June 2003, SmithGroup JJR was hired to prepare a Corridor Management Plan supportive of US-12's designation as a Historic Heritage Route. 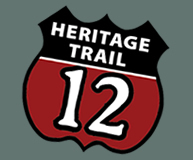 The study included field review of the 129 historical and natural features assembled by the US-12 Heritage Trail Council that are described in the management plan. The purpose of the field review was to photograph and record observations related to the existing conditions and context of the sites as well as assess way-finding issues and vehicle pedestrian conditions. In addition, SG JJR considered the general landscape character crossed by US-12 relative to its contribution to the value of the road as a Historic Heritage Route.